Column: Whatever happened to the gloriously refurbished train station for downtown Jackson? This city sometimes seems more skilled at tearing down what’s left of its assets than at building them up. The Sheraton Hotel, Jackson’s main fruit of 1960s urban renewal, was ripped down in the spring, after a generation of civic efforts failed to deliver new life to the building. The former Consumers Energy headquarters was marketed by City Hall for office and commercial redevelopment, but that failed, too. Now the building is being knocked down in an exceptionally slow and fire-prone demolition project. One asset purportedly being built up is Jackson’s vintage train station. Dignitaries gathered in Jackson on April 9, 2009, to announce $930,000 in federal “stimulus” money would fix up the train station built in 1873. Ultimately, it was said, about $15 million more would be sought to transform the station into an “intermodal” hub with buses, taxi stands, shops and restaurants. “I think things will move fast,” an architect predicted. He was wrong. Four years later, little has changed at the train station to meet the eye. Amtrak cut hours of operation last year, so the station is locked after 2:30 p.m. Passengers arriving or departing on later trains cannot go inside to use the bathroom or sit down. “What a welcome to our town for any first-time arrival,” a friend said in disgust. If the “intermodal hub” ever pans out, the station could at least stay open when Amtrak does not staff its ticket counter. The best I have been able to learn, about $300,000 was spent on asbestos removal at the station. Drainage and masonry work will begin this month. So something is happening. 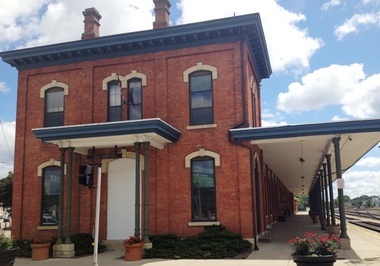 A Michigan Department of Transportation spokesman said the goal of an intermodal hub remains alive, but first the structural integrity of the building must be addressed. That makes sense, but four and a half years seems a long time to address it. My impression – and it could be wrong – is this project is complicated by ownership issues. City and state government dreamed up the intermodal project, but they don’t own the train station. Amtrak owns it. An Amtrak spokesman suggested my impression of slow progress is faulty. Work has proceeded right along, he said. Jackson has either the oldest or second-oldest train station still used for passenger service in the United States. That should be kind of a big deal. Historic appeal aside, those old brick railroad buildings are cool when refurbished. Look at the Wendy’s a few hundred yards from the station. This is one Jackson asset that still begs to be built up.